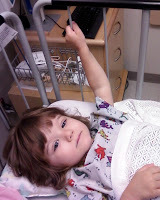 Alyce's surgery went just fine on Tuesday. There were no complications and she is back to normal except for a swollen eyelid. We got to the hospital around 11:00 and did paperwork and tests leading to the surgery at 1:00. 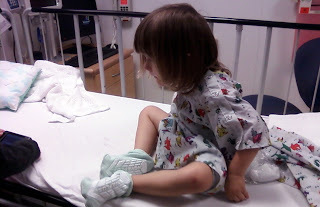 Alyce was her usual shy self and didn't want to cooperate with the nurses or doctors. They were very patient and understanding and eventually got Alyce prepped. We were asked how we thought Alyce would handle being wheeled away from us by strangers. We thought pure hysteria would be the most likely reaction. Because of that they wanted to give her a version of Valium for kids that would make Alyce sleepy and remove any recollection of the event. Mom and I wanted to lessen her trauma and decided to go with their recommendation. It took about five minutes for the drugs to take effect and they were quite effective. The first thing Alyce wanted to do was lay down and after that you could see the stress leaving her face. I would equate it with being intoxicated. Alyce turned into a chatter box and started describing everything she saw. She would pick up her pillow and say "big pillow" and then lay back down on it or look at the design on said pillow and say "pretty tree". Alyce's social anxiety also flew out the window. Every time someone would come into the room she would wave hi to them and could care less if they crossed into her personal space for a test. Alyce would also wave bye bye to them when they left. When they came to wheel her away she continued babbling up a storm and didn't seem to mind at all that Mom and Dad weren't there. The surgery didn't take long at all. After they took Alyce away Mom and I went downstairs to the cafeteria for our first meal of the day. It took ups 30 minutes to get our food, eat it, and get back upstairs. On the trip back up the supplied pager went off informing us that Alyce's surgery was completed and she was back in recovery. 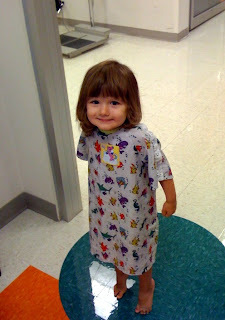 Alyce's exit from surgery more difficult than her entrance. 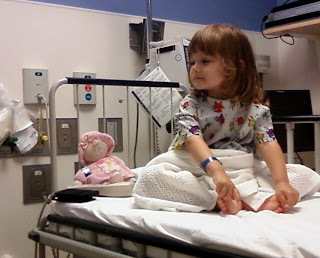 Upon joining her in the recovery room Alyce was irate and crying up a storm. We were warned ahead of time that this sort of behavior is a sideeffect of the anethesia and should go away soon. After some time and pain killers Alyce settled down into Mom's arms and cuddled while watching some sponge bob. Once Alyce drank some apple juice they were able to remove the I.V., tape, and board on her left arm being used to keep that area immobilized. As quickly as it started we were done. 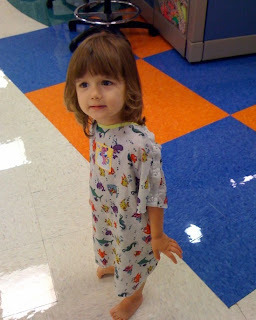 Once Alyce was able to keep her juice down and the I.V was removed we were able to get her dressed and leave. By the time we got home Alyce was back to her normal self; dancing around the house and having a good time. She was pretty spent from the entire experience and hungry as she hadn't had anything to eat all day. We gave her a peanutbutter and jelly sandwich and some milk then put her to bed early. She was so tired she slept until 9:00 the next morning. 0 comments on "After Surgery Update"